The unlikeliest of lovers. The sweetest of loves. Merle Justice wants to reach for the stars, but it’s tough to get respect when playing a teenybopper vampire on TV. Then he meets a famous director anxious to give him all he thinks he wants—and maybe a bit more. Everything’s looking up until a life-threatening encounter with some homophobes on Main Beach puts Merle face-to-face with a Sasquatch-sized hero in a pink puffer coat. Tom Henry defies description. As unsophisticated and simple as an angel, he walks through life content with who he is and asking for very little except to care for his sister, Lily, and the dogs he loves. Then he meets Merle, the embodiment of dreams he barely knows he has. Merle knows the people who hold his future in their hands might love Tom—but they’ll never understand Merle and Tom together. Tom knows it too. 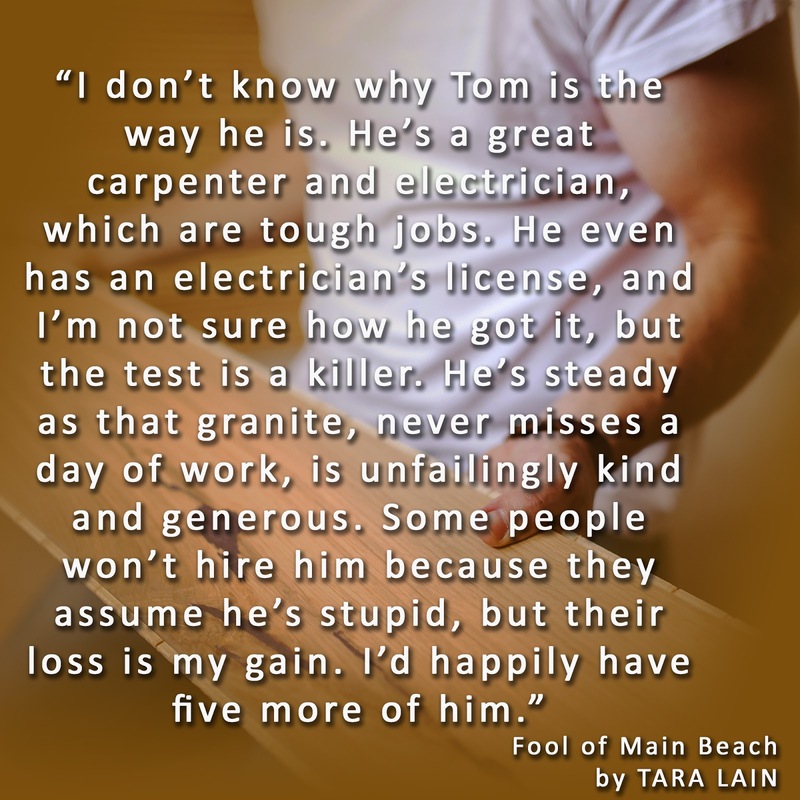 With lives this far apart, who’s really the fool of Main Beach? Merle stretched out the measuring tape and got the dimensions of the huge family space, then paced it off into dining and living areas. Once he had enough measurements to buy rugs, he wandered past the big island into the kitchen and opened each cabinet. His mind filled in the spaces with dishes and pots and pans—yeah, a lot of stuff he didn’t have. His current apartment in Santa Monica was still a transition space from starving-actor digs to TV-star quarters. TV star? He snorted softly. More like vampire of the month. Of course, he’d been lucky enough to be vampire of the month for two years. I’m killing time. Go down to Ru’s studio and take him to lunch. Tom made a waggling motion with his finger. “Oh, didn’t you like it?” Tom looked serious. He shrugged. “I’m much bigger than anybody—except Billy. I’m just a little bigger than him.” He handed over his half sandwich. It was on some kind of multigrain bread and appeared to have cheese that wasn’t American. “Who’s that?” He took a bite and was very happy he did. “Oh, you live with a lady?” Duh, Merle. “Mrs. A. is really nice. She doesn’t want me to have big dogs, though. Wish I could.” He chewed thoughtfully. Merle’s glance snapped to Tom’s face, but Tom didn’t seem to be complaining or confessing. Just stating a fact. “Do you have trouble reading?” He tried to ask it with great nonchalance. “Yes, it’d be a step up in my career. And the guy directing the movie is very well-known and respected.” He glanced over. Did Tom have the slightest idea what he just said? Merle smiled. Leave it to Tom to get to the heart of the matter. Hi! 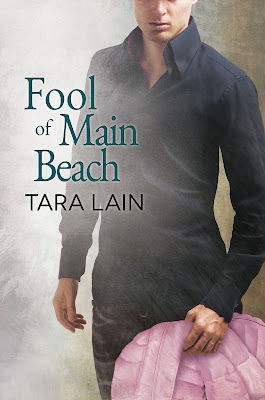 I’m Tara Lain and I’m so happy to be here to celebrate the release of my new romance, Fool of Main Beach. Since some of you may have read a lot of blogs by me, I thought I’d do a little 20 questions where you can guess the answers and then check the cheat sheet below. In Fire Balls, Rodney Mansfield is an artist who, as his artist’s name, calls himself Picasso. 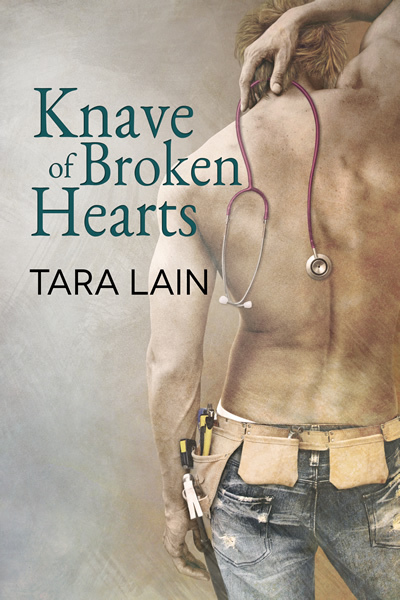 The only one of Tara’s books in which the main (central) character is female is Genetic Attraction. 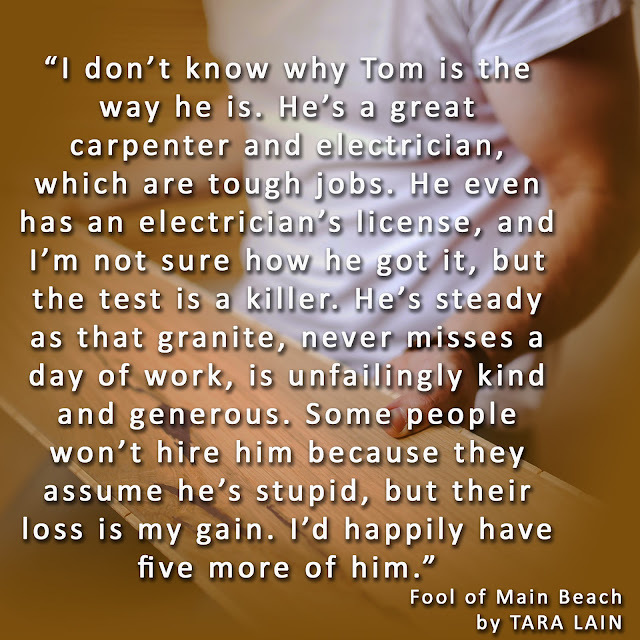 Tara wrote three novels set in the world of football because she’s a football fanatic. 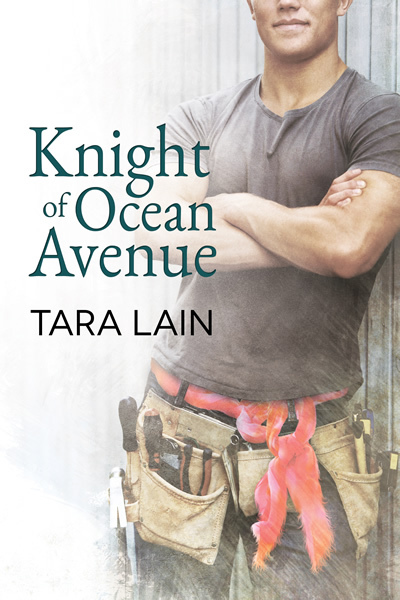 More of Tara’s books are set in Laguna Beach, Ca. than any other location. Tara is a junk food junkie. 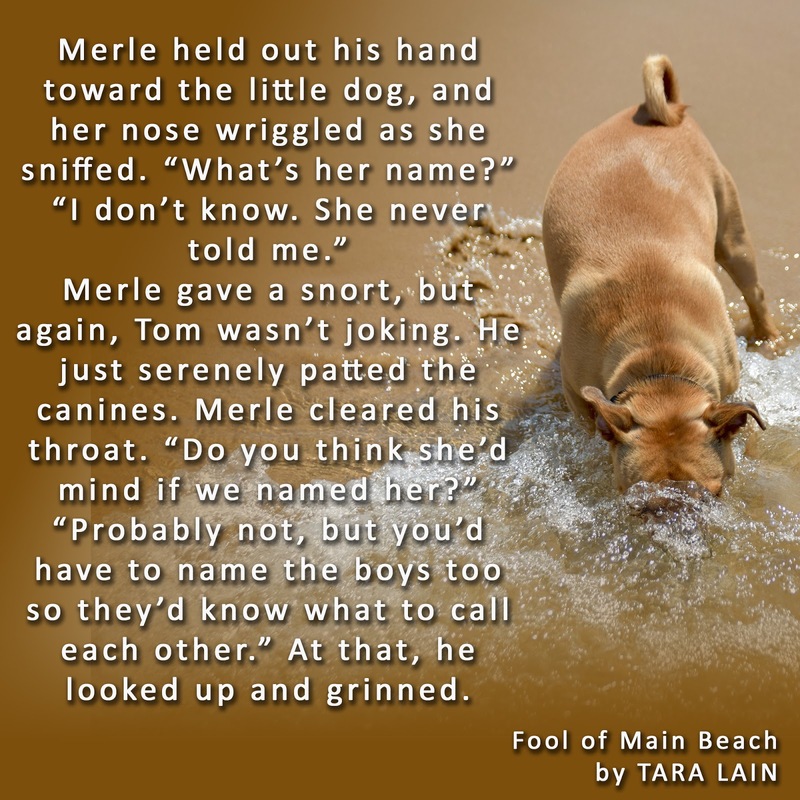 Tara has written books about witches and shifters, but she’s never created an elf. Tara actually created a hero named Sky Sea Mickeljohn. Tara once lived in an ashram. 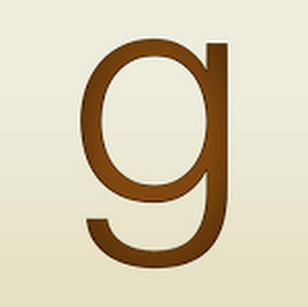 Tara has written novels based on Snow White, Cinderella and Beauty and the Beast. JJ LaRousse in Snow Balls is terrified of snakes. In Knave of Broken Hearts, Jim Carney ends up with an adopted cat named, Anderson who is named for Hans Christian Anderson. One of Tara’ favorite forms of recreation (which she rarely gets to enjoy) is going to the movies – preferably more than one in a day. Tara owns an architectural firm. In Wolf in Gucci Loafers, Lindsey Vanessen masquerades as Supergranny. Chase “Shaz” Phillips comes from a large, loving family. Return of the Chauffeur’s Son is based on the film, Sabrina. False. Love cats and almost all animals. So false. Tara is a health junkie. False. Check out Brush with Catastrophe. He might be but in the book he’s afraid of spiders. False. The cat is named for Anderson Cooper. False. His family threw him out. Hope the list was fun and that you enjoy Fool of Main Beach. 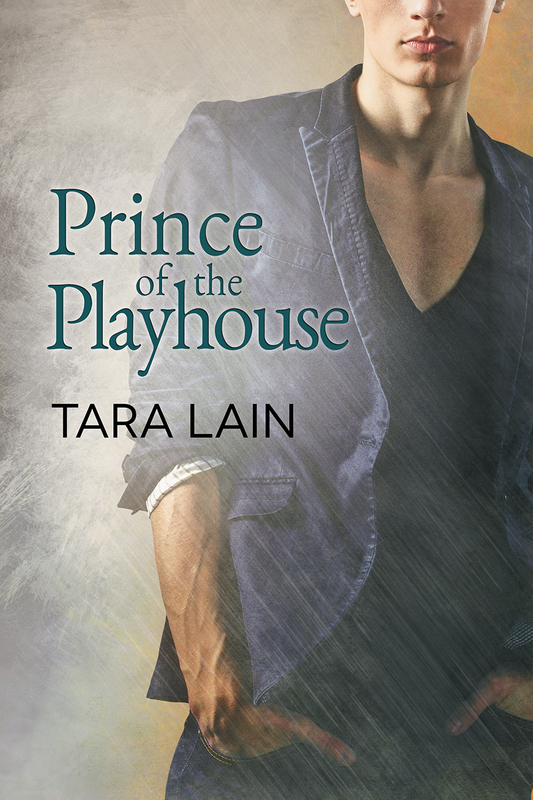 Tara Lain writes the Beautiful Boys of Romance in gay romance novels that star her unique, charismatic heroes. 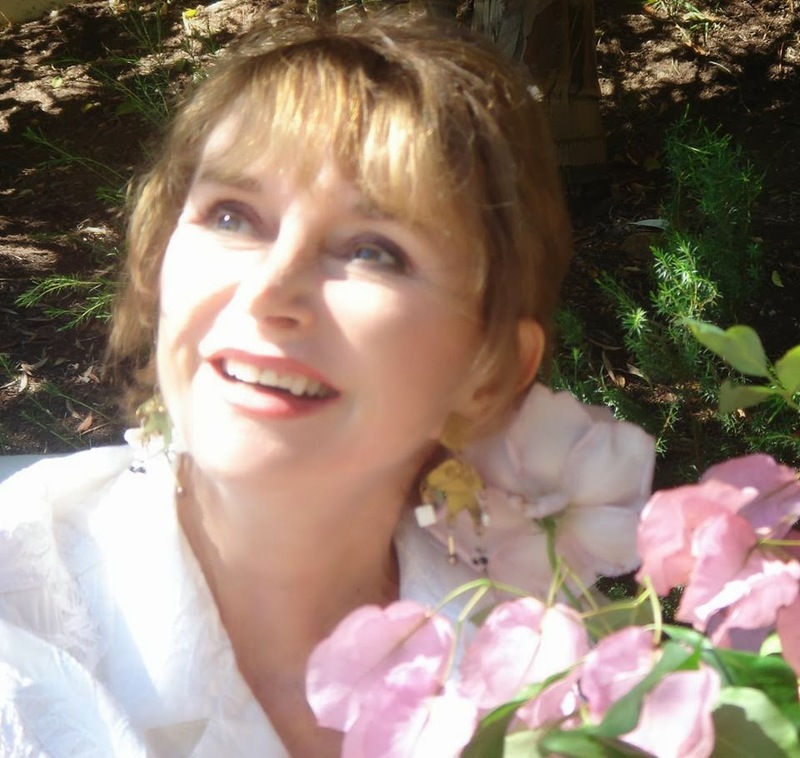 Her first novel was published in January of 2011 and she’s now somewhere around book 40. 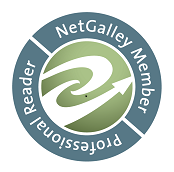 Her best-selling novels have garnered awards for Best Series, Best Contemporary Romance, Best Paranormal Romance, Best Ménage, Best LGBT Romance, Best Gay Characters, Best Romantic Suspense, and more. In her other job, Tara owns an advertising and public relations firm. She often does workshops on both author promotion and writing craft. She lives with her soul-mate husband and her soul-mate dog near the sea in California where she sets a lot of her books. Passionate about diversity, justice, and new experiences, Tara says on her tombstone it will say “Yes”!